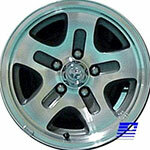 Looking to sell a set of four 1994 Mazda Navajo 14 x 7 OEM Wheels. They look like a Star Pattern with five spokes. Asking $400/BRO + shipping if that is even possible. Anyone interested make a reasonable offer.